Bees are manipulated worldwide to produce many products for human use: honey, beeswax, propolis, bee pollen, royal jelly and venom. They are intelligent insects with a complex communication system. Because bees are seen flying free, they are also often considered free of the usual cruelties of the animal farming industry. However bees undergo treatments similar to those endured by other farmed animals. They go through routine examination and handling, artificial feeding regimes, drug and pesticide treatment, genetic manipulation, artificial insemination, transportation (by air, rail and road) and slaughter. Here I will discuss why animal rights apply to bees. Here you will find not only information about how and why bees are abused and exploited for their honey, wax and other derivatives, but why it is important that we stop doing so. I will discuss the reasons why beekeeping is cruel along with reasons why we should treat bees differently, more humanely. Unfortunately when people think of animal rights, if they do at all, rarely do bees or other insects come into consideration. Yet insects are animals and they like other animals are exploited, abused and factory farmed. If you stop and think about it, you will be shocked to find that there are few creatures on this plant that are not effected by the negative interference of human kind, and sadly bees are no exception. In this, and no doubt other instances of animal exploitation, our mistreatment and use of the other beings with whom we share this world is having a negative effect not only upon the unfortunate creatures themselves, but also upon our own survival. Do not forget for one moment that bees are responsible for the pollination of over ninety percent of the plants we eat. Many species of bees are either now extinct or endangered by our actions, and this includes the bumblebee and the honeybee - the later of course is exploited for honey and other derivatives. Sadly we humans have the misconception that we are somehow justified in enslaving and exploiting other animals, and indeed the entire environment for our use. But do we have the right to do so regardless of the consequences to these creatures, the environment and eventually to ourselves. Most certainly we do not. Surely animals exist for there own purposes and not for the benefit of one species to be enslaved, exploited for food, clothing and entertainment, to be used in experimentation and as labour. Are bees abused, enslaved and exploited? It may surprise you that many people consider that bees make honey for our use, just as as many believe that cow's milk is produced for our convenience, to supplement our diet, when in reality a cow's milk is meant for her calf just as human milk is meant to feed a human baby. How are honey bees abused, exploited and enslaved? Indeed she does unless another animal, man, takes it of course. Many would say we steal their honey. Some people think this is a bit extreme, but consider the reasons why bees make honey. Honey is made from nectar, it takes one bee her entire life-time to produce enough honey to fill 1/12 of a teaspoon, but she is not making honey to provide mankind with a luxury food product he can well do without, no; nectar is collected by the female worker bees to provide food for the queen, the larvae, the drones and to store as food over the winter after being made into honey. Bees are not doing a marvellous and arduous task to provide you with this food, bees like all animals exist for their own reasons. In the case of domesticated bees, if it were not for the intrusion of the beekeeper as he robs the hive of its honey after interfering and manipulating the colony according to his requirements, they would not even be aware of our existence. In short bees make honey for...well...bees! Therefore to take this honey is stealing is it not? Moreover like all theft there is both a negative result for both the victim and, but less obvious, for the perpetrator. We benefit indirectly from the behaviour of bees, as do flowering plants, but only because we indirectly benefit from the pollination of plants which in turn are provided with the means of reproduction as a result of bees spreading pollen from flower to flower as they go about their business of collecting nectar and pollen. Bees are vital for our continued existence as important pollinators of nearly ninety percent of plants which provide us with food. Nevertheless this does not imply that bees are here for our purpose, rather like the flowering plants which are dependent upon bees as a means to reproduce we are in turn indirectly dependent upon their continued existence, as of course without plants we would not survive. So we, rather like the plants, are benefited by the behaviours of bees but only as an indirect effect of their behaviours which have evolved to bring about their continued survival rather than ours. All life forms it seems are interconnected, dependent on other life forms for their survival in indirect ways, but no species has evolved to directly serve the purposes of another. Such anachronistic ways of thinking are born mostly from religion and need to be revised. On this page I will discuss the following issues: Why honey is stealing; methods of bee keeping and how they compare to factory farming; the serious circumstances of colony collapse disorder CCD and other threats to the survival of bees and why it effects us, and reasons why it is just as important that we should stop exploiting bees as indeed we should stop exploiting and mistreating any animal. Their loyalty and attachment to their queen cannot be surpassed: no distress or extremity is able to overcome it. Nor is their patriotism inferior to their loyalty. Every private interest and every appetite seems to centre, or rather to be lost, in a zeal for the public good. In labouring for this they wear out their little lives, which they are ready every moment to sacrifice in its defence. Each restrains its own appetite in order to bring the greatest possible addition to the common stock of honey; and when the cells are once closed up, it does not presume to break one of them open, unless urged by absolute necessity, and even then exhibits a pattern of frugality and temperance : but if the public stores be attacked, no inequality of strength of size will deter it from assaulting the aggressor. The above quotation from Thomas Young's, 'An Essay on Humanity to Animals,' written in in 1798 eloquently describes the importance of honey for the bees and the zeal with which they support the queen and the colony and protect their supplies. No I don't think bees consider that they are making the honey for our benefit or are willing to share it, do you? Not only does the taking of honey make us thieves and in the case of the factory farming of honey, animal abusers but taking honey makes us parasites, after all what do we give the bees in return? Sadly in the case of large scale beekeeping only slavery, cruelty, deprivation and sometimes death. For at least 150 million years Bees have been producing honey for their own nutritional needs. The collection of nectar to produce honey involves intensive labour. The gathering of pollen and nectar is the task of the female bees called worker bees who have a structure on their legs called a pollen basket. The basket is constructed of a row of stiff hairs that form a hollow space on the outside of the bee's legs, most usually her back legs. The bee combs grains of pollen into each of the baskets every time she visits a flower. Bees collect nectar by sucking it up with their specially adapted long and slender hairy tongue called the proboscis, and store it until they return to the hive in an anterior section of the digestive tract near their throats called the crop. It is the nectar that is made into honey which bees store in large quantities in the hive for use as food. Bees produce honey by repeatedly regurgitating, as much as fifty times, and dehydrating nectar. Bees then store this honey as food for the hive during the winter when little or no nectar or pollen is available to them. Bees feed on nectar, primarily as a source of energy, and pollen, mostly for protein and other nutrients. Most of the pollen collected by bees is used to feed the larvae. During a typical collection trip a honey bee visits 50 to 100 flowers. thirty-five pounds of honey to provide enough energy for a small colony of bees to survive the winter. Worker bees will live only for a few weeks if they are born in the spring, but if they are not born until autumn they may continue to live throughout the winter. For a worker bee her final job, and perhaps the most arduous, during the last few weeks of her life is to collect pollen and nectar for the hive; the honey so tirelessly produced is stored in the hive as food for the winter months. I am sure you will agree that the life of a worker bee collecting honey is one of extreme labour and exhaustion. Is there any surplus honey? Yes sometimes there is a surplus, not that this of course justifies humans taking it as such intervention, as you will see later on, is often of detriment to the bees. Do the beekeepers take only the surplus? Most certainly in the case of large scale beekeeping the answer is mostly NO. In the autumn some large scale beekeepers extract, that is steel, ALL the honey and than feed the colony with sugar syrup or corn syrup. Honey is stored in the hive as winter food for the bees . Yes, sometimes they make more than they can eat, but do the beekeepers only take the extra? No, according to James E. Tew, an Extension Specialist in Apiculture at Ohio State University in Wooster, "Commercial beekeepers frequently extract [steal] all fall-season honey and then feed colonies either sugar syrup or corn syrup in quantities great enough to provide all the winter food the bees would need" (Tew). (Everyone steals most of the spring-season honey.) Theft of all of the fall-season honey is merely the most blatant form of exploitation. Bees are also often fed in the fall in preparation for winter and in the spring and early summer to ensure the hive gets off to a good start (Bonney, 131; Vivian, 101). That is, to make the bees start working earlier than they would normally. The sugar that is fed in the fall is turned into honey by the bees, so even if a beekeeper tells you their bees survive on honey over the winter, much of that honey may have simply come from Ziplock bags full of sugar water. A typical hive in the UK uses at least 8 kg (17.6 lbs.) of sugar per year (Consumers in Europe Group, 21). In the US, a typical figure can be 25 lbs. .. Some people claim the sugar water is better for the bees than honey, and if this is the case, I don't want to hear any claims about the health benefits of honey or pollen. Sugar water may be better if the bees had particularly poor nectar sources in the fall, but this would not normally be a problem if their spring honey hadn't been stolen. Honey is more than sugars; it contains very small (by human standards) amounts of fats, proteins, vitamins and minerals that bees' bodies might like to use over the winter. Extract from Why honey is not vegan where you will find more information about bees. Bee keepers claim that honey bees have been selectively bred to produce an excess of honey. If this were the case the fact remains that the lives of bees are nonetheless interfered with in a detrimental way to obtain this surplus, and furthermore in the case of large scale bee keeping, the above practice of taking all the honey still takes place. Moreover, do we have the right to selectively breed any animal to cater to our needs? Most certainly not ! Compare this also to cows who also have been selectively bread to produce more milk. Often you will see cows with huge udders which are of course not natural and are a result of selective breeding, these oversized udders are heavy and prone to mastitis and cause the animal much suffering. The fact that animals have been bred to produce access of these products by no mean justifies our continued abuse of these animals. Left to reproduce naturally in the wild animals, including both bees and cows, will return to their natural state, become once again what evolution or nature intended. It is a fact that bees, like many species of animal on the planet, are enslaved and exploited, and like other more familiar animals are factory farmed. Their natural existence is interfered with by man entirely for his own benefit. The very structure of the modern bee hive is designed to control and exploit the bee colonies. We have domesticated bees for about 10,000 years, before that honey was taken from wild hives. Until 1682 when removable top bar frames were introduced in Greece, bees were kept in forests in containers hanging from trees and also in logs, baskets and pots, all of which lay horizontally to the ground. In 1851 a more efficient hive, in regard to controlling the lives of bees and extracting their honey, was invented. It was not until 1851 that the modern Langstroth hive was invented (where else but in the US). Here the combs fill up entire frames (like a window screen) and are rectangular. This makes hives stackable and since the frames are of universal size, they can be interchanged between hives and prepared by humans. Additionally, honey extraction equipment can be built due to the standard size. A queen excluder is generally used to keep the queen from laying eggs in the area where the beekeeper only wants honey stored. Additional frames can be added as necessary to allow for and encourage excess honey production. Needless to say, the Langstroth hive caught on very quickly and is the hive of choice today. New technology is on the horizon that allows even greater efficiency in extracting honey (Lomas). So if a beekeeper tells you that they are only continuing an ancient tradition, keep in mind that the practices they are using are only 100 years old and are radically different from the methods that existed for millennia. They also have nothing in common with non-Western beekeeping methods that emphasize humility, respect, and truly being part of nature, as opposed to managing nature for human gain. More often than not in the large scale beekeeping system, there is a lack of concern regarding the bees' lives. From here on I will refer to large scale beekeeping and factory farming interchangeably as they are one and the same. Rather like more familiar farm animals, many people think of the idyll of bees kept in a few hives in people's back yards or gardens, with bees basically living their lives as nature intended, flying in and out of their hives as they collect pollen and nectar, gently buzzing on a warm summer's day. And indeed this is the case to some degree. However the majority of the honey you will eat comes from large scale factory farming as do most of your eggs, meat and dairy products. Full-time beekeepers will have as many as 300 plus hives. The bees in factory farms most certainly do not live out their lives according to their natures. During the course of the season the lives of bees are under the control of the beekeeper who routinely examines and handles the bees, some are killed in the process. Bees are in addition like other factory farmed animals subjected to artificial feeding regimes, artificial insemination, treatment with drugs and pesticides, genetic manipulation, transportation and slaughter. The queen bee, around whom in the case of honey and bumble bees their whole social structure is based, is a much abused creature in the factory farming system of beekeeping. In nature there is usually only one mated queen in a hive or colony and she is selected from larvae by the worker bees and specially fed in order to become sexually mature. In the case of factory farmed bees man selects the next queen after killing the reigning queen after she has lived for only two years, In Israel they are killed and re-queened every year. Without man's intervention queen bees may live for up to five years. Why you may ask? Why does man interfere with a processes of nature which has evolved over millions of years. Surely nature knows best and can manage quite well without our interference. Evolution adapts a creature for survival, but sometimes an adaptation which is of benefit to the animal is often an hindrance to man however, and is seen as a liability. For a number of reasons man sees many of the creatures on this earth not as living beings with their own purposes but as commodities for his use. Moreover this use is, particularly in modern times, not to supply others of his kind with food, but often to supply the few with luxuries that are not really of any nutritional value, and often the sole purpose of the exploitation of such animals is to make money rather than feed people. As with all factory farming every intervention in bee keeping is done solely to increase profit not to provide people with food, which in the case of honey is a luxury food and one we can well manage without, lets not forget this for a moment. There are some exceptions of course, the amateur hobbyist for example who may interfere little with his bees taking only a small amount of honey. Nonetheless even a modicum of intervention must result in death or other detriment, however inadvertently, that would otherwise not occur. In my opinion though bees like all creatures should be left to follow the dictates of their own natures and live their lives without negative intervention at any level or to any degree. Also many hobbyists or backyard beekeepers cut off the queen's wings. He may also kill the reigning queen. Here are some of the ways in which man controls bees: clipping the queen's wings, killing the old queen to replace her with a new queen as already mentioned, using a smoker to control bees to make them docile, transportation, artificial insemination and other manipulative control of the hive. In the case of the honey bee, man's intervention in the ways mentioned above is done for a number of reasons, for instance killing or removing the wings of the reigning queen is done to prevent swarming (more about this later on), other interventions are undertaken to subdue aggression and mite infestation, but this is not of course for the benefit of the bees but rather to maximise the production of honey. Lets look in more detail at some of the ways in which beekeepers detrimentally interfere with their bees. Bees are subjected to transportation for many miles by road, rail and air. 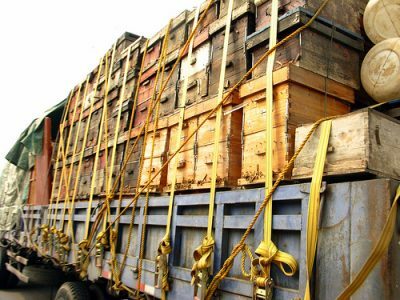 In order to follow the nectar flows to increase the production of honey, and consequently profits, bees are packed into lorries like so many crates of bananas, not living beings. Bees are also transported thousand of miles to pollinate crops. Also replacement queens, more about this further down, are commercially supplied by mail order and often transported in less than ideal conditions, such as being exposed to the elements, left in the sun to become desiccated or cold for hours, or thrown around like so much baggage. They can be left for days in storage until collection, even exposed to insecticides, in fact just about anything can happen. Such treatment of our more favoured animals such as a cat or a dog would not be allowed, yet such happens to bees. Further interference with the colony comes in the form of a smoker, a method used to assert control over the hives in order to make the bees docile and prevent them stinging the beekeeper or anyone in the vicinity and to prevent bees becoming more aggressive when their territory is intruded upon and their honey is stolen. This method of subduing the bees as their colony is invaded has been in use since ancient times. Right back in ancient Egypt and earlier honeybees were kept, on the walls of the sun temple of Nyuserre Ini from the 5th Dynasty, before 2422 BC, workers are depicted blowing smoke into hives as they are removing honeycombs. Today more sophisticated devices are used as as that shown in the picture below. 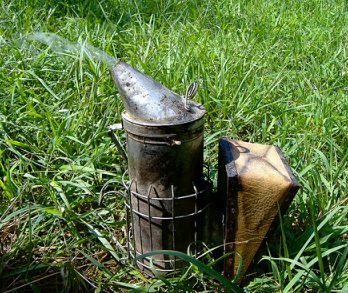 The device generates smoke which has a calming effect on the bees because it initiates a feeding response and induces the bees to glut themselves on honey in anticipation of possible hive abandonment due to fire. Also when a bee consumes honey the bee's abdomen distends, making it difficult for her to make the necessary flexes to sting. In addition smoke masks pheromones - honey bee pheromones are mixtures of chemical substances released by individual bees into the hive or environment that cause changes in the physiology and behaviour of other bees. Pheromones are released by the guard bees, worker bees whose task it is to protect the entrance of the hive from enemies and who also raise the alarm which would alert the colony and cause defensive agitation and aggression. After all, their honey which is their food supply is being stolen. Such is bound to result in aggressive responses. Pheromones are also released by bees who are inevitably injured during a beekeeper's inspection. Indeed many of their number are squashed or otherwise harmed as is bound to occur in such situations, but I imagine that just like other farmed animals no one cares, after all they're only bees, at least according to the perspective of large scale beekeepers. Introducing smoke creates an opportunity to open the beehive, take the honey while the natural defence response mechanism of the bees is interrupted. The most shocking form or cruelty is the practice of killing off the bees in the autumn. Despite the dire situation regarding Colony Collapse Disorder CCD and the consequent threat to bees, in colder areas some large-scale beekeepers kill off their hives before winter, using cyanide gas. Some beekeepers will burn the beehives, killing all the bees inside. This seemingly counter productive and cruel act is done for financial considerations; killing the bees is apparently cheaper than housing, feeding and providing disease prevention over the winter. Considered as a financial liability bees are killed without compunction. For these people bees are merely a means to an end, these creatures are of value only to make honey or rather money. Although not all bee keepers do this; bees who are factory farmed are more likely to be treated this way, there is the attitude that bees have no status as living beings and no value except a monetary one. Moreover If you hear that in fact only a few bee keepers do so, the minority, it is important to consider that such statistics are misleading. Consider that even though most backyard or hobbyists bee keepers do not kill their bees nonetheless a good number of bees are killed this way. Compare the numbers: Factory farmed bee hives may number as many as 300 compared to ten to twenty hives kept by backyard or hobbyist beekeepers. Even if beekeepers do not directly kill their bees intentionally, many will die at the hands of beekeepers that would not have otherwise done so without man's interference. As you can see already the modern practice of beekeeping is a form of factory farming and like all factory farming is exploitative and cruel. There follows more examples of exploitation, many of which may surprise you because as already mentioned people think bees live out their natural lives without interference of any kind and only surplus honey is taken. Moreover some people even have the misconception that the beekeeper actually keeps bees for their protection and that without such protection bees cannot survive. Rather like the erroneous idea that sheep need us to shear them and cows need us to milk them. Yes indeed many sheep due to selective breeding now depend on the shearer to cut their wool but this is not natural and is a result of man's intervention. Beekeepers like to control the lives of their bees, they do not want their colonies to increase in an uncontrolled way or in other words as nature intended; many of these methods of control are harmful to the bees. A disturbing and increasingly common abuse is artificial insemination. Many people would think the implication of abuse concerning an insect is simply a misnomer. Why! bees, as are all insects, are animals are they not, sentient beings aware of themselves and others of their own kind, otherwise they would not be able to co-operate in any way one with another even at a basic level, never mind the tightly and highly organised system of the hive. You will be able to read more about sentience and intelligence in bees in Page Two. It is a fact that after copulation in nature the male bee dies, but that is nature however seemingly cruel. Yet man's intervention by comparison appears even more horrific. The artificial insemination of the queen also involves the death of the male and involves pulling off his head. This sends an electrical impulse to the creature's nervous system which triggers sexual arousal. The lower half of the animal's decapitated body is than squeezed to make him ejaculate which is than collected in a hypodermic syringe. Queen bees are than artificially inseminated with the combined sperm obtained from several decapitated bees. This is done on the anesthetised queen by injection. If beekeepers do not want to increase the number of hives there are several methods of swarm control. Swarming is the process whereby one colony will divide into two with the queen departing with a good percentage of the original colony. More rarely more than just one swarm occurs. In nature at some stage bee colonies swarm and divide when a new queen is chosen or when there is overcrowding. Prior to swarming the queen lays her eggs. New queens are raised and the hive may swarm as soon as the queen cells are capped and before the queens emerge from their queen cells. Swarming is the natural means of reproduction and takes place usually in spring when the reigning queen leaves the colony, usually before the virgin or new queen emerges. The departing queen is accompanied by a large group of worker bees, approximately sixty percent during a primary swarm. Secondary swarms may occur but this is not usual and they are much smaller and are accompanied by a virgin queen, a queen bee that has not mated with a drone. On these rare occasions the entire hive may become almost entirely depleted of worker bees by a succession of secondary swarms. Although this is not a problem in nature of course it is a predicament for beekeepers, as it effects the season's production; the hive may be so depleted that there will be no production of honey for the entire season, therefore swarm management is undertaken by beekeepers. One way beekeepers attempt to reduce swarming is by clipping one of the queen's wings. This method does not prevent swarming as such but allows the beekeeper to collect the bees who would have otherwise left the hive and become feral; because the queen is not able to fly the swarm will gather outside the hive from where they can be easily collected by the beekeeper rather than fly elsewhere. Another method of control involves replacing the reigning queen who is ready to swarm with a newly mated one. The appearance of queen cells are a dramatic signal that the colony is determined to swarm. Queen pheromone suppresses queen cell raising and swarming preparation by worker bees. Queens produce less pheromone as they age. As a result hives with older queens swarm more readily. Replacing the queen therefore minimises the likelihood of any further attempts to swarm. In order to influence the natural swarming process beekeepers observe colonies for signs of swarming in spring in order to take control of the situation and keep the bees together to avoid depletion of the colony and the loss of the entire honey crop. Sometimes beekeepers will also clip off one of the middle or posterior legs from the queen. Having been mutilated she will be unable to properly place her eggs at the bottom of the brood cell. The worker bees detect this and will rear replacement queens. This will bring about a natural occurrence called superdure a process by which an old queen bee is replaced by a new queen. In nature Superdure may be initiated due to the old age of a queen or a diseased or otherwise failing queen. There are many methods of swarm control and you may read about them in Wikipedia Swarming (honey bee) - Wikipedia, the free encyclopediafrom where the extract below was taken. In the Demaree method a frame of capped brood is removed with the old queen. This frame is put in a hive box with empty drawn frames and foundation at the same location of the old hive. A honey super (A honey super is a part of a commercial beehive that is used to collect honey) is added to the top of this hive topped by a crown board. The remaining hive box sans queen is inspected for queen cells. All queen cells are destroyed. This hive box, which has most of the bees, is put on top of the crown board. Foraging bees will return to the lower box depleting the population of the upper box. After a week to ten days both parts are inspected again and any subsequent queen cells destroyed. After another period of separation the swarming drive is extinguished and the hives can be re-combined. If you 're not familiar with beekeeping terminology or know much about the biology of bees the above may seem rather confusing and I was tempted to include an explanation of terms but considered this would make the example rather lengthy. I think the main points concerning cruelty to bees is obvious without explaining all the terminology. Cruelty such as All queen cells are destroyed is self explanatory along with the obvious interference with the normal life processes of bees which most likely results in the deaths of many them. As you can see, bee keeping is a complex procedure, it is a major interference with the lives of these creatures and involves much abuse. For those of us who care about all creatures without discrimination the keeping of bees is surely to be considered inhumane, cruel and exploitative, an enslavement. It is very similar to the treatment of other factory farmed animals. Moreover in a similar way our treatment of bees may have an adverse effect on the environment. The recent phenomenon of colony collapse disorder CCD may well be the result of man's interference with the natural processes of bees. The phenomenon called Colony CCD sometimes called also honeybee depopulation syndrome HBDS effects the European honeybee. Although this event has happened before throughout the history of apiculture, a limited number of occurrences resembling CCD have been documented as early as 1896, it has not previously occurred to quite such a drastic degree as it did in the northern USA in October 2006. This is when the term CCD was first used after beekeepers were reporting the loss of between thirty and ninety percent of their hives. It is true of course that during the winter there are some losses. However the enormous extent of the loss is highly unusual. The main and most alarming symptom of this phenomenon is simply that after the winter there are no or very few adult bees left in the hive, however there are no dead bees, the bees are simply not there! The queen however is present and alive as are the brood (immature bees). Often there is honey in the hive. The honeybee is the most important pollinator in the world. Although North America appears to be the country where this phenomenon has been most dramatic it has occurred also here in the UK and throughout the rest of Europe to include Belgium, France, the Netherlands, Greece, Italy, Portugal, and Spain, and to a lesser degrees it has been reported in Switzerland and Germany. Also possible cases of CCD have been reported in Taiwan. Beginning in October 2006, some beekeepers began reporting losses of 30-90 percent of their hives. While colony losses are not unexpected during winter weather, the magnitude of loss suffered by some beekeepers was highly unusual. The bee population of Europe has been falling at an alarming rate. In the UK, it dropped by around 30% between 2007 and 2008, according to the British Bee Keepers Association. BBC NEWS | World | Europe | Why are Europe's bees dying? The big question is: Why? The search for factors that are involved in CCD is focusing on four areas: pathogens, parasites, environmental stresses, and bee management stresses such as poor nutrition. It is unlikely that a single factor is the cause of CCD; it is more likely that there is a complex of different components. The cause or causes remains a mystery. However, although inconclusive, a number of possibilities have been speculated. Biological causations have been suggested such as Varroa mites and insect diseases including Nosema apis and Israeli acute paralysis virus. Since the 1980s bee populations have declined in the USA as a result of these diseases and pests, particularly varroa and Acarine (Tracheal) mites. Environmental change related stresses, malnutrition and pesticides have also been attributed as possible causes. Migratory beekeeping, unnatural conditions in which bees are transported thousand of miles to pollinate crops, as discussed above, has also been considered as another possible cause. With the decline in bee populations since 1940 when honey bee colonies numbered 5 million, as compared to only 2.5 million today, along with an increased demand for hives to supply "pollination services" bees have been transported for increasingly greater distances and at a greater frequency. Poor nutrition as a result of apiary overcrowding, crop spraying, artificial insemination of queens, and sugar water feeding are thought to all contribute to a general weakening of the constitution of the honeybee. Also implicated is the possibility that malnourishment may be due to the pollination of crops with low nutritional value; scarcity of pollen or nectar; genetically modified crops with pest control modifications; a limited or contaminated supply of water and radiation from mobile phones, although this last seems less likely. In the case of GM crops, though there seems to be no conclusive evidence, it does appear to be a logical possibility. It is possible that there may be no single cause and CCD may be the result of an accumulation of a number of stresses to which bees have been subjected in recent years and which have weakened colonies. Stress in general compromises the immune system of bees and may disrupt their social system and increase susceptibility to disease. At the present time there is no real answer to this bewildering occurrence. In my opinion, if not the cause, human intervention in the form of beekeeping, which most certainly disrupts the socials system of bees, and GM crops and others issues mentioned above play a significant role in this phenomenon. Surely man's intervention in the natural cycles of life now known to be the cause of environment damage plays some role in the tragedy of CCD.Two and a half thousand miles of travelling! Trapped in their hives surely this is an abuse of any creature. Bees are a barometer of what man is doing to the environment, say beekeepers; the canary in the coalmine. Just as animals behave weirdly before an earthquake or a hurricane, cowering in a corner or howling in the wind, so the silent, empty hives are a harbinger of a looming ecological crisis. Monsanto, the genetically modified food giant, has recently purchased Beeologics, a leading bee research firm. Borrowing a move from the tobacco companies’ playbook, Monsanto appears to have decided that if you do not like the scientific reports coming out about you, then you should just buy the labs. Beginning in 2007, Beeologics has researched two critical bee issues: colony collapse disorder and Israeli Acute Paralysis Virus. In late September of last year, Monsanto acquired Beeologics for an undisclosed amount. In making this purchase, Monsanto now has control of research that has previously pointed at its pesticides for contributing to – if not outright causing – a sharp decline in bee populations. Multiple studies in recent years have linked pesticides and high fructose corn syrup with colony collapse disorder. mid-day when honeybees and and indeed bumblebees and other bees are about collecting nectar and pollen. Use of pesticides is a danger to the environment, and crops and garden plants are well able to thrive without their use. Consider that before the development of such chemicals crops grew as did garden flowers. Organic vegetables and flowers are of course grown with out recourse to pesticides. Pesticides are far too easily available in garden centres where advice is often given to use them instead of more humane and environmentally friendly alternatives. Despite warnings on some of the containers not to use were bees are likely to be collecting pollen, it is unlikely that the average buyer really pays much heed to such advice. Furthermore such advice is perhaps only included to make the manufacturers look good, as though they are doing their bit towards the environment, and in this case bees, when the reality of the situation is that the use of these chemicals is very disruptive to the environment, including ourselves, which of course has been widely known since Rachel Carson wrote 'Silent Spring' in 1965. In addition you should try and plant flowers or other plants that provide a good source of nectar and pollen. Where land is given over to agriculture bees depend upon gardens to provide them with suitable flowering plants. Find out which plants, both flowers and vegetables native to your particular country that bees favour and which provide them with a good supply of nectar and pollen and plant these in your garden such as bee balm, red clover, fox glove and joe-pye weed, include the allium family, all the mints, beans and flowering herbs. Bees like daisy-shaped flowers - asters and sunflowers, also tall plants- hollyhocks, larkspur and foxgloves. 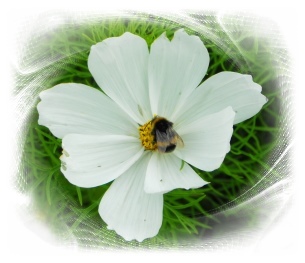 You will find links to more information, which includes facts sheets about how to grow a miniature meadow in your garden, in the section for bumblebees page 3. Page Three: a mention of Bumblebees. PETA Prime: Celebrating Kind Choices: But What About Honey? Is It Cruelty-Free? Below is an extract from the above article, to read the complete article please the above click link. "Beekeeping is big business, to be sure: 15 to 30 percent of all food crops depend on bees for pollination. Like all factory farming, beekeeping has morphed into an industrial process which puts profits ahead of animal concerns. Commercial beekeepers truck some 2.4 million hives all over the country to track seasonal crops. These journeys clobber the bees with physiological stress, pesticides, diseases, and related disorders. Even small outfits and hobbyists subject their bees to cruelty, such as cutting off the queen’s wings so that she can’t swarm." Good facts about bees and why honey is not Vegan. Bees are hardworking animals who deserve to keep the labour of their work. Stealing products from them is a form of exploitation, which should and can be easily avoided. Honey can be replaced by rice syrup, barley malt, maple syrup, molasses, sorghum or fruit concentrates. Important please note:I am not an animal expert of any kind just your average person who loves animals, all animals, and feels deeply about the plight of many of our fellow creatures. Neither am I a writer, or any other expert. Therefore please keep in mind that the information included in this website has been researched to the best of my ability and any misinformation is quite by accident but of course possible.